As low molecular weight proteins, restriction from glomerular filtration is minimized, permitting significant amounts of Ig light chains to be endocytosed into the proximal tubule epithelium, particularly in plasma cell dyscrasias. Recent studies have shown that this effect of concentrating light chains within the proximal tubule alters cell function. This study demonstrated that light chains belonged to a class of proteins that are capable of catalyzing the formation of hydrogen peroxide. Sufficient amounts of hydrogen peroxide were produced in HK-2 cells to stimulate the production of monocyte chemoattractant protein-1 (MCP-1), a key chemokine involved in monocyte/macrophage migration and activation of the proximal tubule, and to increase lactate dehydrogenase release into the medium. The light chain–mediated effect on MCP-1 production was inhibited by co-incubation with 1,3-dimethyl-2-thiourea, which also inhibited lactate dehydrogenase release, and by pyrrolidine dithiocarbamate, an inhibitor of NF-κB. The amount of light chain that stimulated an intracellular redox-signaling pathway in the proximal tubule cells was well within levels that are seen in patients who have plasma cell dyscrasias. The conclusion is that light chains possess a unique property that permits the development of intracellular oxidative stress that in turn promotes activation of the proximal tubule and elaboration of MCP-1. Major functions of the proximal tubule include reclamation of filtered low molecular weight proteins, such as Ig light chains, and other essential molecules that are carried by proteins, such as folate (1–3). Ig light chains, once termed Bence Jones proteins (4), appear in the circulation as monomers (Mr approximately 22 kD) and dimers (Mr approximately 44 kD). Metabolism of these proteins is directly related to GFR (5–7). The approximate 500 mg of free light chains that is produced by the normal lymphoid system daily is filtered and catabolized by the kidney in the proximal tubule, such that only approximately 1 to 10 mg of polyclonal light chains normally appears in the urine (4–8). Light chains in the tubular fluid are absorbed into the proximal tubule epithelium by binding initially to a receptor that consists of megalin and cubilin (9–12). After endocytosis, vesicles that contain the ligand/receptor complex acidify to release the light chain and other bound ligands, permitting recycling of the receptor back to the apical membrane to load more cargo; the subsequent addition of lysosomal enzymes permits hydrolysis of the light chain protein and return of the amino acid components to the circulation (2,3,13). In the setting of a plasma cell dyscrasia, however, light chain production increases significantly, producing circulating concentrations of monoclonal light chain that can approach 100,000 mg/L (7,14). Although saturation of the multiligand endocytotic receptor complex of the proximal tubule permits light chains to appear in the tubule fluid of the distal nephron and finally in the urine, overproduction of monoclonal light chains can result in significant concentration of these proteins in the proximal tubule. In recent years, attention has turned to the possibility that the process of excessive protein reabsorption by the proximal tubule in pathologic states results in chemokine and cytokine release, which accelerates interstitial fibrosis and progressive renal disease. For light chains, this process has been characterized in some detail. Proximal tubular reabsorption of light chains sparks the activation of the redox-sensitive transcription factor NF-κB (15) and mitogen-activated protein kinases (16); these signaling pathways cooperate to promote chemokine and cytokine production by this epithelium (15–17). The event that initiates these signal transduction pathways has not been elucidated and was the focus of this study. A recent series of elegant studies showed that intact Ig and antigen-binding fragments (Fab) can oxidize water to form H2O2 (18–20). In these experiments, molecules that contained both heavy and light chains were used but not light chains alone. Intrigued by these observations, this laboratory performed a series of experiments that showed that light chains per se are capable of oxidizing water to form H2O2 and further sufficiently alter cellular redox signaling to stimulate the production of monocyte chemoattractant protein-1 (MCP-1) in cells in culture. Six unique monoclonal Ig light chains (three κ and three λ) were purified in a standard manner from the urine of patients who had multiple myeloma and light chain proteinuria. All six patients had clinical evidence of significant renal damage that was presumed to be cast nephropathy, although renal biopsy was not routinely performed in these patients. Endotoxin levels for each light chain preparation were below the lower limit of detection of the assay (Limulus Amebocyte Lysate, QCL-1000; Cambrex Bio Science Walkersville, Walkersville, MD). In solution, these light chains exist as monomers, dimers, and higher molecular weight forms. Chicken egg albumin (CEA), delipidated human serum albumin (HSA), and catalase (from bovine liver) were obtained from a commercial vendor (Sigma-Aldrich, St. Louis, MO). Protein concentrations were determined using a kit (BCA protein Assay Reagent kit; Pierce, Rockford, IL). Experiments were performed as described previously (19). Briefly, 100 μl of sample protein, 3 μM in PBS, in a sealed glass container was exposed to near-ultraviolet (UV) radiation (312 nm, 800 μWcm−2) for 0.5, 2, 4, and 6 h, using a transilluminator (Electronic Dual-Light Transilluminator; ULTRA-LuM, Carson, CA). Experimental controls included samples that were not exposed to near-UV radiation. In addition, light chains were examined after dialysis against 20 mM EDTA-containing PBS for 48 h.
H2O2 production was determined using a kit (Amplex Red Hydrogen Peroxide/Peroxidase Assay Kit; Molecular Probes, Eugene, OR). Treated samples and standards were mixed with Amplex Red working solution and incubated at room temperature for 30 min, protected from light. Fluorescence emission excited at 535 nm was detected at 560 nm (Packard Fusion Universal Microplate Reader; Packard Instrument Co., Meriden, CT). All samples were performed in duplicate and averaged. HK-2 cells (21) were grown on six-well plates that were coated with type I collagen (Rat Tail collagen type 1; BD Biosciences, San Diego, CA), 5 μg/cm2, and maintained at 37°C with 5% CO2/95% air in Keratinocyte Serum-Free Medium (Life Technologies Invitrogen Corp., Carlsbad, CA), supplemented with EGF (0.2 ng/ml) and bovine pituitary extract (30 μg/ml). Once confluent, the medium was exchanged with Keratinocyte Serum-Free Medium that contained light chains (1 and 5 mg/ml), CEA (15 mg/ml), or HAS (15 mg/ml). The concentrations of light chains were chosen on the basis of the range of serum levels (0.1 and 100 mg/ml) that were seen in patients with multiple myeloma (7,14) and the estimated glomerular sieving coefficients of these low molecular weight proteins (22,23). Incubation continued for 24 h at 37°C. Medium was harvested for determination of H2O2, using the commercial assay (Amplex Red Hydrogen Peroxide/Peroxidase Assay Kit, Molecular Probes). In other studies, HK-2 cells were grown on sterile chamber slides (Nalge Nunc Int., Naperville, IL) until a monolayer formed. Medium was then changed to medium that contained two representative isotype light chains (κ2 and λ3), 1 and 5 mg/ml, or with medium alone, and cells were incubated at 37°C for 24 h. The cells were then incubated in HBSS that contained 5-(and-6)-carboxy-2′,7′-dichlorodihydrofluorescein diacetate (carboxy-H2DCFDA; Image-iT LIVE Green Reactive Oxygen Species Detection Kit; Molecular Probes), a reliable fluorogenic marker for reactive oxygen species (ROS), following the protocol provided by the manufacturer. Cells were counterstained with Hoechst, washed, mounted, and imaged immediately using a fluorescence microscope (Leica, Heidelberg, Germany) equipped with a digital camera (Model C5810; Hamamatsu Photonics K.K., Hamamatsu City, Japan). For determination of whether light chains were endocytosed into HK-2 cells, the κ2 and λ3 light chains were initially labeled with FITC, using a kit (EZ-Label Fluorescein Protein Labeling Kit; Pierce) and following the directions provided by the manufacturer. HK-2 cells were then incubated for 6, 12, and 24 h in medium that contained the FITC-labeled light chains (1 mg/ml). Cells were counterstained with Hoechst (1:1000), washed, and fixed in 4% paraformaldehyde for 10 min at room temperature. The slides were mounted and imaged immediately using a fluorescence microscope. The protocol was similar to the previous design, except the medium was also supplemented with 2% FCS to prevent loss of monocyte chemoattractant protein-1 (MCP-1) before assay. The conditioned medium was used to determine MCP-1 levels, which were quantified using a sandwich enzyme immunoassay (Human MCP-1 ELISA Kit; R&D Systems, Minneapolis, MN). Each sample was assayed in duplicate and averaged. 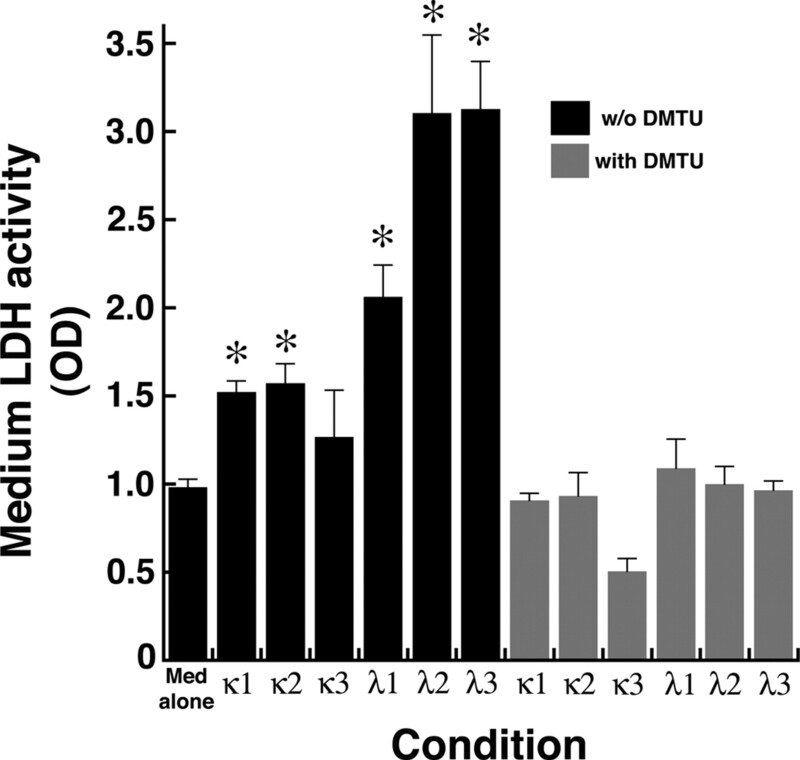 The effect of inhibition of intracellular ROS on light chain–induced MCP-1 production was examined by co-incubation of cells that were exposed to the λ3 and κ2 light chains with 1,3-dimethyl-2-thiourea (DMTU; 30 mM), a cell-permeable chemical trap for H2O2 (24). In additional experiments, HK-2 cells were incubated in medium that contained λ3 and κ2 light chains and pyrrolidine dithiocarbamate (PDTC; 200 μM), which served as a cell-permeable, selective inhibitor of the redox-sensitive transcription factor NF-κB (25,26). Assessment of cellular lactate dehydrogenase (LDH) release into the medium after 24-h incubation of HK-2 cells under the various conditions was determined using a kit (Roche Diagnostics, Indianapolis, IN). Data were expressed as means ± SE. Significant differences among data sets were determined by ANOVA with post hoc testing (Fisher protected least significant difference; Statview, version 5.0; SAS Institute, Cary, NC). P < 0.05 assigned statistical significance. The protocol replicated that used by Wentworth et al. (19). After exposure to near-UV radiation, all six human light chains catalyzed the generation of H2O2 (Figure 1). 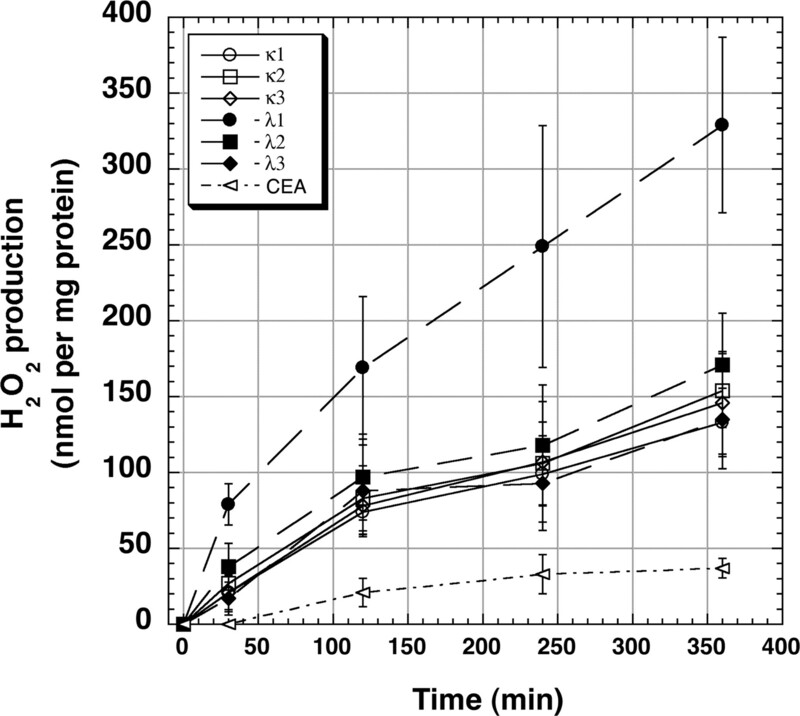 All proteins can generate small amounts of H2O2 under these conditions, because of photo-oxidation of accessible amino acid residues (W, Y, C, M, and H), but the effect is saturable, as demonstrated by CEA (3 μM). In contrast, H2O2 production by the light chains continued to increase during the course of the experiment. Addition of 10 mg/ml catalase abolished the Amplex Red signal, indicating that the effect was related specifically to H2O2. Additional controls, which included buffer alone that was exposed to near-UV radiation and the same light chains that were not exposed to near-UV radiation, did not generate H2O2. Exhaustive dialysis of the light chains against EDTA-containing PBS before study did not diminish production of H2O2, so the effect was not related to the presence of trace metal ions. H2O2 production detected using the Amplex Red method. After exposure of the solution to near-ultraviolet (UV) radiation, at each time point, all six light chains tested generated significant amounts of H2O2, compared with chicken egg albumin (CEA; n = 5 experiments at each time point in each group). Overnight incubation of HK-2 cells with each of the light chains (5 mg/ml) increased medium concentrations of H2O2, compared with cells that were incubated in medium alone and cells that were incubated in medium that contained 15 mg/ml HSA and 15 mg/ml CEA (Figure 2). Exposure of HK-2 cells to medium alone and to delipidated HSA and CEA did not produce detectable levels of H2O2, determined using the Amplex Red assay technique. Intracellular generation of ROS was observed in carboxy-H2DCFDA–loaded cells that were incubated with two representative light chains (κ2 and λ3; Figure 3). Incubation of HK-2 cells with all six human light chains (5 mg/ml) resulted in the generation of H2O2 in the medium, which was detected using the Amplex Red method. 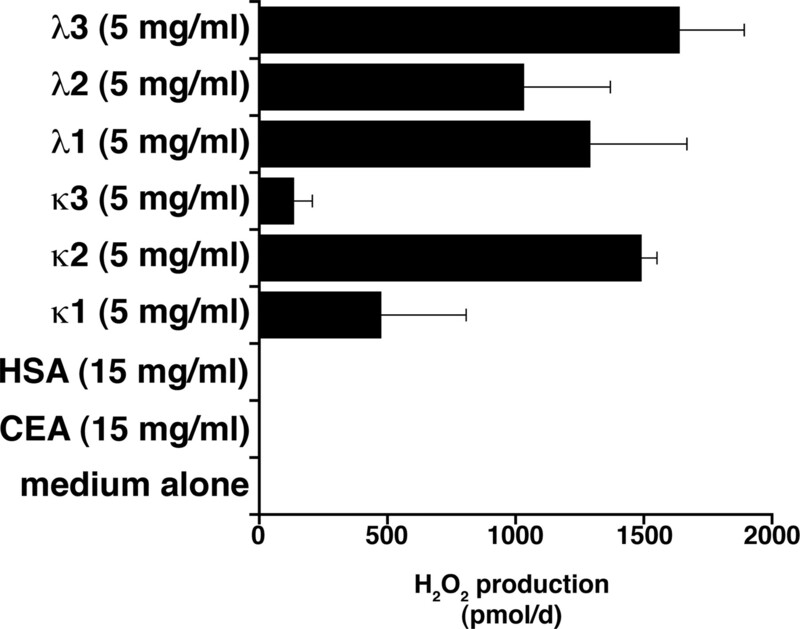 H2O2 in the medium was not detected when the cells were incubated in medium alone and in medium that contained 15 mg/ml human serum albumin (HAS) and CEA (n = 6 to 18 experiments in each group). Two representative isotype light chains (κ2 and λ3), 1 and 5 mg/ml, generated oxidative stress in HK-2 cells. After incubation in medium that contained the light chains, the cells were labeled with 5-(and-6)-carboxy-2′,7′-dichlorodihydrofluorescein diacetate (green), a fluorogenic marker for reactive oxygen species (ROS), and counterstained with Hoechst (blue). Both light chains increased cytoplasmic levels of ROS, compared with cells that were exposed to medium alone (control). Bar = 50 μm. In additional experiments, the κ2 and λ3 light chains were initially labeled with FITC and then incubated with HK-2 cells overnight. Fluorescence microscopy detected the presence of the FITC label within the first 6 h of incubation and persistence for the duration of the experiment (Figure 4). The κ2 and λ3 light chains were initially labeled with FITC and then incubated with HK-2 cells. The light chain concentration was 1 mg/ml. Within the first 6 h, uptake of both labeled proteins (green color) was observed. Intracellular localization of the proteins persisted for the duration of the experiment. Bar = 50 μm. Overnight incubation of HK-2 cells with the light chains (1 and 5 mg/ml) resulted in a dosage-dependent increase in MCP-1 production (Figure 5). Compared with medium alone (367.5 ± 41.1 ng/d), MCP-1 production did not increase when cells were incubated in medium that also contained 15 mg/ml HSA (171.8 ± 18.0 ng/d) and 15 mg/ml CEA (286.7 ± 40.3 ng/d). The effect of inhibition of intracellular ROS on light chain–induced MCP-1 production was examined by co-incubation of cells that were exposed to 1 mg/ml λ3 and κ2 light chains, 30 mM DMTU, and 200 μM PDTC (Figure 6). Both agents inhibited MCP-1 production that was generated by the light chains. 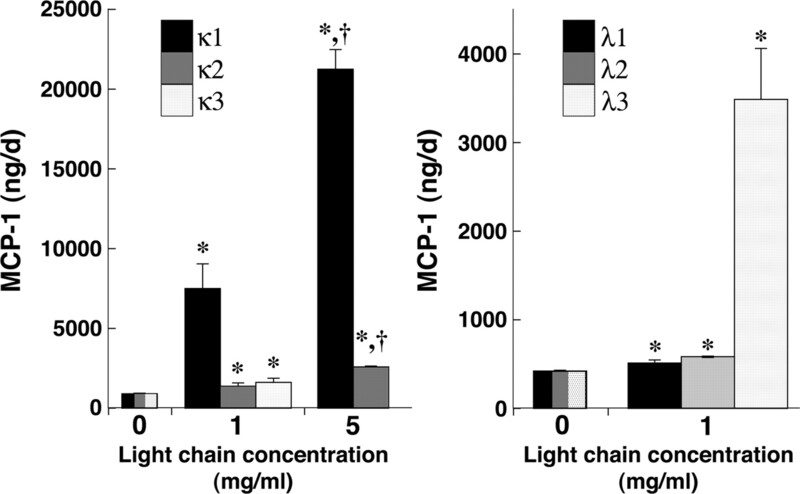 Effect of 24-h incubation of six different light chains on monocyte chemoattractant protein-1 (MCP-1) production by HK-2 cells. Because there were limited amounts of some of the light chains, two light chains (κ1 and κ2) were used to demonstrate a dosage-dependent effect on MCP-1. *P < 0.05 versus medium alone; †P < 0.05 versus 1 mg/ml (n = 6 to 18 experiments in each group). Co-incubation of HK-2 cells with two representative light chains (λ3 on left; κ2 on right) and 1,3-dimethyl-2-thiourea (DMTU), a cell permeable inhibitor of ROS, or pyrrolidine dithiocarbamate (PDTC), an inhibitor of NF-κB, inhibited the production of MCP-1. *P < 0.05 versus the other three conditions (n = 6 to 18 experiments in each group). LDH release from HK-2 cells was determined after 24-h incubation in medium that contained each of the six light chains, with and without 30 mM DMTU (Figure 7). Five of the six light chains increased LDH activity, compared with experiments that used medium alone; LDH release was inhibited by the addition of DMTU. Effect of overnight incubation of HK-2 cells with the six different light chains on lactate dehydrogenase (LDH) release into the medium (n = 6 experiments in each group). Five of the six light chain proteins increased LDH release, compared with control (medium alone). The simultaneous addition of DMTU inhibited the LDH release. *P < 0.05 versus control and the same light chain with DMTU. This series of experiments using six different Ig light chains produced results that were similar to those that were generated by other investigators who used >200 different intact Ig and Fab fragments to show that these proteins catalyze the formation of H2O2 (18,19). Thus, light chains also belong to a unique class of proteins that are capable of generating H2O2. The variable domain (VL) of light chains contains a hydrophobic core of β sheets. Using a xenon tracer, Wentworth et al. (19) demonstrated that this pocket in the VL of the light chain was the site of initiation of H2O2 production. This site was also identified in a molecular modeling analysis that was performed by Datta et al. (27). Typical of the light chains that were used in our studies, free κ and λ light chains form monomers, dimers, and polymers in solution (4). Although not demonstrated in this study, we hypothesize that the intrinsic ability of light chains to generate H2O2 relates to this unique property of the VL domain, perhaps accentuated by the propensity of light chains to self-associate and function without the requirement of an adjacent heavy chain. In HK-2 cells, as well as other cell types, H2O2 in low dosages serves as an intracellular signal transduction agent (28–31). The next series of studies therefore focused on the potential role of light chains to mediate the production of MCP-1 through redox signaling. This important chemokine was chosen for study on the basis of the following observations. Locally produced MCP-1 plays a major role in tubulointerstitial inflammation, because MCP-1–deficient mice demonstrate similar amounts of glomerular injury but less tubulointerstitial damage after development of nephrotoxic serum nephritis (32). In human diabetic nephropathy with associated advanced tubulointerstitial disease, serum MCP-1 levels did not change, but urinary MCP-1 levels were elevated, suggesting intrarenal production. Urinary excretion rates correlated with the number of macrophages identified in the interstitium, and the proximal tubule was identified as one source of MCP-1 in these studies (33). MCP-1 also induced the proximal tubule to produce additional inflammatory mediators (34). In the kidney, proximal tubule cells are a major source of MCP-1, and production is increased in proteinuric conditions (35). As summarized by Viedt et al. (36), the combined information supported a seminal role for local MCP-1 production, particularly in proteinuric conditions that result in progressive renal disease. In addition, recent studies by Agarwal (37) demonstrated that intravenous iron stimulated MCP-1 production through generation of oxidant stress. In this study, incubation of HK-2 cells with light chains produced a dosage-dependent increase in MCP-1 production. These data supported previous studies by Batuman's laboratory (15–17). Addition of DMTU inhibited MCP-1 production as well as LDH release that was induced by the light chains; addition of PDTC also inhibited MCP-1 production. The combined findings demonstrated a role for the generation of ROS, particularly H2O2, in activating the proximal tubule cells in culture. It is interesting that the capability of light chains greatly exceeds the ability of other proteins, such as albumin, to activate the proximal tubule epithelium. In very high concentrations, many proteins, including HSA, seem to stimulate MCP-1 production (31,38), although the effect of albumin is controversial, because Sengul et al. (15) showed no effect of albumin on MCP-1 production. Our studies were in agreement with those of Sengul et al. (15) in that neither delipidated HSA nor CEA at 15 mg/ml promoted H2O2, and the amount of MCP-1 production by HK-2 cells that were exposed to these proteins was greatly exceeded by light chain–induced MCP-1 production. Even in proteinuric states, however, the amount of albumin that is delivered to the proximal tubule has been predicted to be less than levels that were used in these in vitro experiments, which typically ranged between 5 and 30 mg/ml. For example, direct micropuncture experiments demonstrated that proximal tubular fluid albumin concentration of rats increased from 6 μg/ml in the normal condition to 74 μg/ml with immunologically induced nephrotic syndrome (39). In aminonucleoside nephrosis, the proximal tubule fluid albumin concentration ranged between 0.16 and 2.3 mg/ml (40). In the setting of a plasma cell dyscrasia, light chain production increases significantly, producing circulating concentrations of monoclonal light chain that can approach 100,000 mg/L (7,14). The amount of light chain that was used in our studies was well within the predicted tubular fluid concentration of light chain in multiple myeloma. The requirement for the proximal tubule to endocytose and catabolize these proteins generates intracellular oxidative stress that results in elaboration of chemokines and cytokines that might facilitate the renal fibrosis that accompanies cast nephropathy (17). However, understanding the process of tubular epithelial cell activation by light chains potentially becomes important, not only in cast nephropathy but also in chronic kidney disease in general. As GFR falls, the serum concentrations of polyclonal κ and λ light chains increase (41,42); the tubular concentration will increase in the remaining viable nephrons and proximal tubular epithelium. Although perhaps not all light chains produce this effect, it is interesting to speculate that, regardless of the underlying cause, chronic kidney disease per se increases the filtered load of light chains (typically polyclonal) that is presented to the remaining proximal tubules, potentially resulting in persistent activation of the epithelium and perpetuation of a proinflammatory environment that accelerates renal disease progression. These studies demonstrated that light chains catalyzed the production of ROS, particularly H2O2. The site of production of H2O2 is unclear, because light chains could catalyze the formation of H2O2 extracellularly, although intracellular accumulation of light chains was detected within the first 6 h of the experiment. H2O2 can pass through lipid bilayers either by diffusion or through aquaporins (43) and would permit activation of the cell regardless of the site of formation of this important ROS. This unique feature of light chains might explain their effects on cellular function after uptake of the protein, whereas other physicochemical features of the light chain determine tropism for particular cells. For example, light chains that promote light chain deposition disease and amyloidosis undergo endocytosis into mesangial cells and subsequently alter cell function, whereas light chains that do not cause glomerular disease do not alter mesangial cell function (44–46). In addition, Brenner et al. (47) demonstrated that an amyloidogenic light chain but not a control light chain from a patient who did not have cardiac involvement promoted oxidative stress that altered function of cardiomyocytes. In our study, sufficient levels of H2O2 were generated in HK-2 cells in culture to promote MCP-1 production. Although all light chains tested in these experiments were obtained from patients with advanced kidney disease, these findings suggest a potentially common mechanism of activation of an intracellular redox-signaling pathway after exposure of the cell to light chains. This work was supported by grants from the Office of Research and Development, Medical Research Service, Department of Veterans Affairs, and from the Multiple Myeloma Research Foundation. We thank Kristal Aaron for excellent technical assistance.